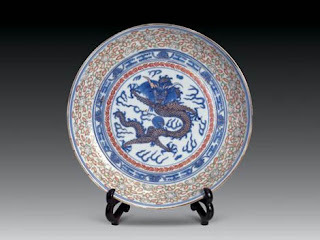 Linglong porcelain 玲珑瓷 was created and developed on the basis of pieced work during the Xuande reign of the Ming Dynasty (1368-1644). Reputed as "porcelain inlaid with glass", linglong porcelain is famous both at home and abroad for its exquisitely carved patterns and glittering, translucent appeal. Grain-sized holes were hollowed out in the thin roughcast and the glaze was applied several times to cover them. Then, the half-finished products were baked in kilns to produce linglong porcelain. Characterized by pierced ornamentation, the porcelain saw some developments in terms of technique in the Qing Dynasty. During this period, craftsmen ingeniously integrated the techniques of making blue-and-white porcelain with that of linglong porcelain to create the blue-and-white linglong porcelain much loved by the people. The dark-green transparent linglong designs and emerald-green blue-and-white patterns served as a foil to each other, creating a unique sense of beauty. Linglong wares were generally limited to small objects, such as cups, brush pots and covered jars. The decoration was sometimes unglazed, left either white or enhanced with gilding or colored glazes.